Venice, California is one of the few towns that is as interesting in person as it appears to be on TV. The beach scene is a mix of yuppies, hippies, drug dealers, surfers and tourists. 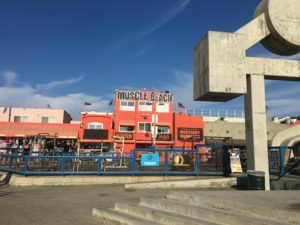 Muscle Beach, the outdoor gym, is real and full of bulked up men and women, some in bikini briefs. If you’re lucky and wandering around on a Sunday you’ll probably find a drum circle on the beach. Brightly colored murals adorn the walls. And of course, there’s the skate park. 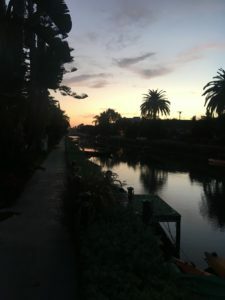 And the canals are real as well — get your steps in at dusk or drop a canoe and paddle like a local. Venice is dense. It’s dense in people, traffic and culture. One thing you can be sure of in Venice is that weird flies high. Where Austin has state government and a large contingent of Texas conservatives, both fiscally and religiously, Venice has Santa Monica as its close neighbor and plenty of Hollywood influence. There’s not much to temper the eccentricity. 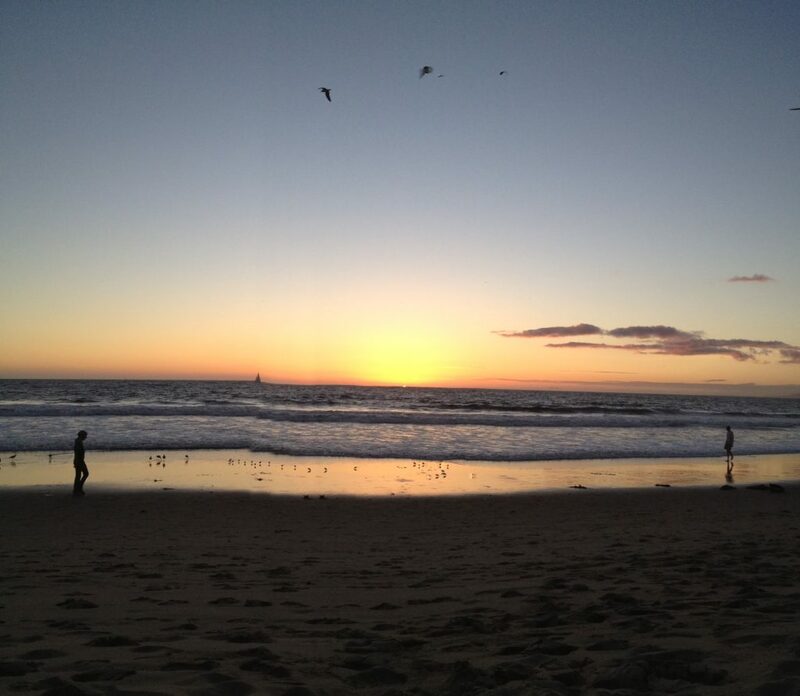 It’s not nearly as blissful as the sunsets make it seem. Years ago, when we were more regular visitors to the area, Abbott Kinney was cool. One of the main attractions was Abbot Pizza. Simple. Easy. Good. But this past trip, October 2016, we discovered that Abbott Kinney is now, according the impeccable press, both America’s Coolest Street (Forbes) and The Coolest Block in America (according to GQ via The Huffington Post). While we aren’t fan of absolute superlatives, we like the street, and the Mystic Journey Bookstore, an excellent new age/metaphysical bookstore. * Technically, Venice is a neighborhood in Los Angeles. It’s coastal neighbor, Santa Monica is a city and Marina Del Rey, to the south is a Census Designated Area. The estimated population of Venice in 2008 was approximately 40,000.